The tale of the SockapalOOOza socks begins with a field-trip to Woodland Woolworks and the purchase of three skeins of Knit One Crochet Too Ambrosia in color 713 – a yummy dark eggplant with the unassuming name of Plum. It’s a scrumptious blend of 70% baby alpaca, 20% silk and 10% cashmere, and you can’t believe how soft and luxurious this yarn feels when knit and blocked. Our tale continues with a what the heck do I do for a sock pattern comment made to the always enterprising Alice of Tangle Knitting Studio. I wanted something unusual, but the yarn choice really required something that had an understated classiness, a certain je ne sais quoi. Alice suggested that I look through her collection of 1940’s patterns. There must be one or two decent sock pattern in there, right? 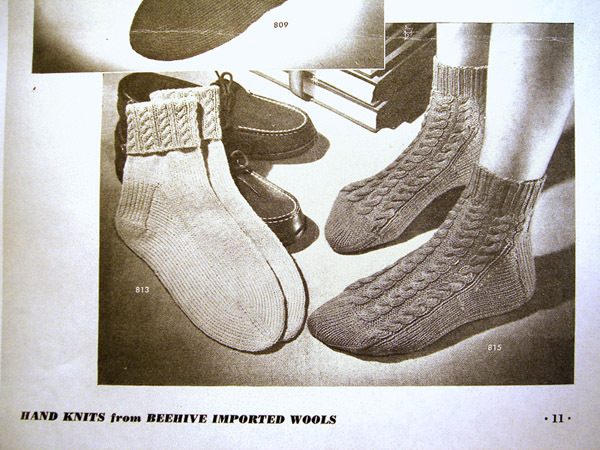 And, sure enough, I found this cabled anklet pattern in Hand Knits by Beehive – Socks for Men and Women, published in 1949. Now, these are anklets, and really I wanted taller socks. And this pattern is worked top-down, and I’m a toe-up sock knitter. So that meant that a little pattern modification was in order. I think that the end result is a reasonable facsimile of the original. The one really glaring difference is the ribbing on the top. The pattern calls for 2×2 ribbing. I didn’t have the pattern with me when I started the ribbing, and so I did 1×1 rib to match the heel stitch. When I checked the pattern and saw my mistake, I was already 1″ into the ribbing. I debated with myself for a long time, but in the end I let the mistake stand. I think the 1×1 looks better. I also altered the pattern slightly on the ankles. I found that the cables all around the ankle pulled in too tightly and made the socks hard to get on. I switched to a slightly larger needle size and added an extra purl between each ankle cable. I switched back to the smaller original needle size for the ribbing. Sock pal: If you ever decide you don’t want these socks, please feel free to send them back! Here’s a close-up of the ribbing. This picture shows the cables well. The yarn was not the easiest to work with because of the “fuzz factor” and its slickness. A dropped stitch traveled swiftly and was hard to pick up. For that reason I used a cable needle on all of the cable turns. That slowed me down on the turns, but I made the time up in fewer dropped stitches. I bound off using a tubular (i.e. Kitchener) bind off. I’ve used this method before and the results are always good. But for some reason on this pair of socks it just looks extra good. It’s almost impossible to tell how or where I either cast on or bound off. And that was exactly the effect I was looking for. Here’s a close-up of the heel. I’m sure that there are a lot of knitters out there who think me unusually daffy because I had never seen this particular heel before. I have since learned that it’s a completely common heel on top-down patterns. In fact, darn near every pattern I look at, it seems, uses this heel. But I had never seen it in a toe-up pattern. Really! It could be because I so seldom use patterns for socks. Or maybe it is unusual. I don’t know. Regardless, I reinvented it for myself by knitting the top-down pattern heel turn backwards, with a slight modification. I love the heel turn results. The heel fits great. And the turn has no holes at all, even though no wraps were done on any of the short rows. Pretty cool, eh? I’m also quite pleased with the look of the gusset increases. They’re almost seamless. Technique: Toe-up, two at a time, on double circular needles. 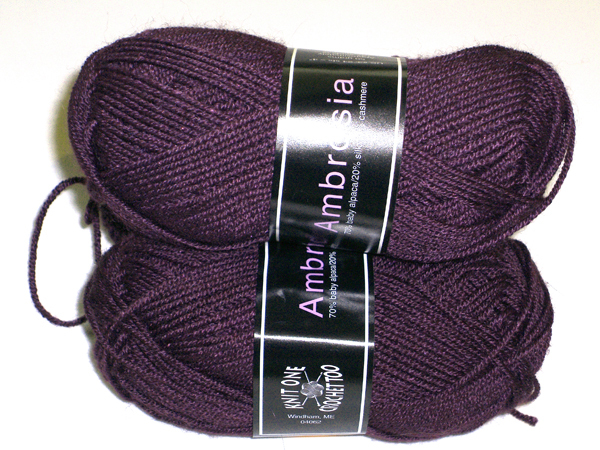 Yarn: Knit One Crochet Too Ambrosia, 70% baby alpaca, 20% silk, 10% cashmere (50-gr, 137 yds); color 713 – Plum; 2-1/2 skeins. Needles: Foot and ribbing: one pair Suzanne ebony circular needles in size 3.0mm. I stupidly broke one by sitting on it. It was replaced by an Addi Turbo of the same size. Pattern: Modified (and worked backwards) version of Cabled Anklets from Hand Knits by Beehive – Socks for Men and Women, published in 1949. [P.S. added 05/31/2006 10:55 am] And I got some great socks, too!